Do You Think Your Pet Has The Cutest Face? Send In Your Photos and You Could Win!!! 2. You Cannot Put Any Makeup or Hair Elastics in Pets Fur. 3. Your Pet Must Be Bare, All Pets Are Naturally Cute. 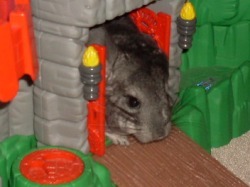 You May or May not put your chinchilla in cute poses or in a playhouse, like Minnie, here.